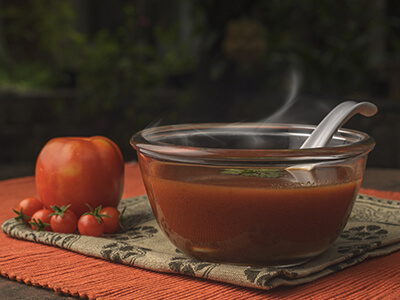 Tomato Moong Soup is filled with the goodness of tangy tomatoes and protein­ rich moong dal, specially formulated to satiate pre­meal hunger. A protein rich low calorie entree, for the figure conscious. 1. 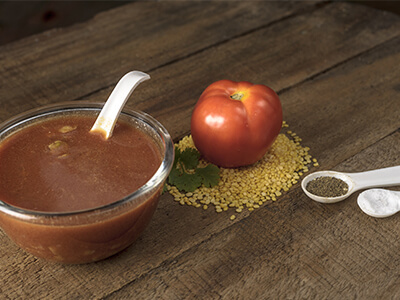 Both tomato and moong are low glycaemic index foods with high fibre, that helps in regulating blood glucose level. Low glycemic index foods helps in achieving satiety earlier and also helps in the reduction of body fat percentage. 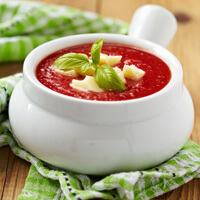 2.Tomato is a rich source of potassium which helps in managing blood pressure in case of hypertension. 3. Lemon contains vitamins such as C, B6, A, E, folate, niacin and flavonoids. It could help in preventing diabetes, constipation, high blood pressure and indigestion. 4. Garlic promotes increased bile production which helps in the reduction of fat in the liver. This in turn can reduce bad cholesterol in the blood.